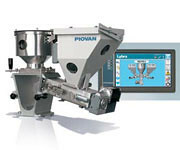 Auxiliary equipment supplier Piovan�s latest Lybra doser series, for feeding all types of products, comprises continuous weight-loss gravimetric dosing units, which stand out for their high precision, advanced controls and intuitive user interface. Each unit can accommodate up to two independent dosing stations, which can even be of different capacities or retrofitted to meet changing production needs. Each dosing station can be configured for individual capacities up to 170 kg/hour. The line's construction and features have changed over time to better satisfy the requirements of the market, and offer end users concrete benefits in terms of production and cost. At the present time, five configurations are available. The dosing unit is available in several versions � basic, PET pro, Micro-dose, Extrusion Pro and Recycling Pro. All configurations are fitted with microprocessor controllers with 7-inch touch screens. A single screen, with intuitive graphical interfaces, allows the operator to control operation of the whole system, compare preset dosing values with actual values, check instantaneous production values and access all the unit's functions.